Have you ever had one of those days where you just have a feeling about something? A few days ago I stopped at the Goodwill in a neighboring community. I wanted to look for a set of dishes. Just before Christmas my sweetheart, my dear little mother and I were in a Goodwill about an hour south of home when I spied some wonderful old dishes. I really wanted to bring them home but we were in a bit of a rush to meet a deadline soon afterward, the lines were long and I wasn't sure I should spend the money with Christmas purchases still to be made. So I left them there! Later that evening as we drove toward home I was sure I had made a mistake. I wanted those dishes. I knew exactly where I would keep them. I knew just how I would use them. I thought about them so much that I nearly drove all the way back to that store the next morning to see if they were still there. But I didn't. Since then I haven't been able to get them out of my mind. 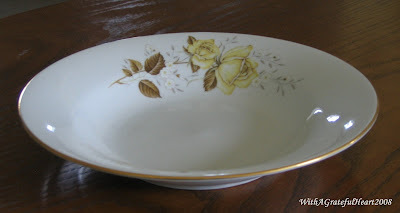 And I decided that the next time I found a set of dishes that I really loved - at a good price - I wouldn't hesitate. So, the other day as I drove toward the Goodwill close to home I had this 'feeling'. This.could.be.my.day. 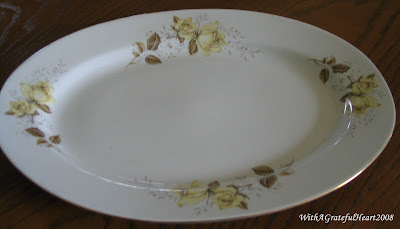 Some of my blog friends seem to find dishes all the time that are just perfect. I felt sure I would find some, too, if I kept looking. The parking lot was full - oh, no! I was sure they were all in search of dishes. Most of the shopping carts were taken but I found one and headed straight to the dish aisle. As I rounded the corner I could not believe my eyes. Viola! A set of dishes that must have been put there just for me!! I was in love. Instantly. They couldn't have been more perfect for me. The price was great. I quickly put them into my cart. I browsed through the store a bit longer but found nothing else I wanted. As I made my way to the checkstand three different ladies stopped me to admire and exclaim over my find. One of them told me to find her and let her know if I changed my mind. She would buy them. No way was I going to change my mind. When I got to the checkstand and gave the cashier my Goodwill Club Card nearly $5.00 was discounted off the already-low price. What.a.deal! Here is what I found. 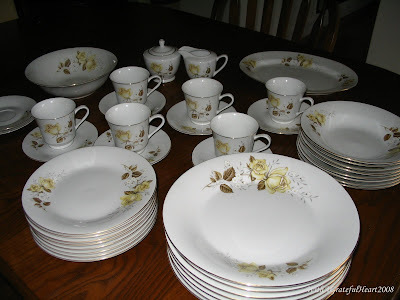 7 dinner plates, 8 salad plates, 8 soup bowls, 6 cups and saucers, 2 extra saucers, a serving bowl, a platter and a darling sugar bowl and creamer. With yellow roses! My favorite! 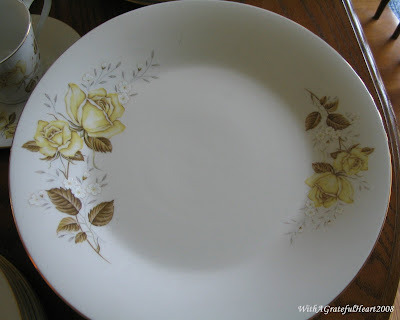 Wonderful dinner and salad plates. . . Cute little bowls. . . Cups and saucers. . . A serving bowl. . . Platter. 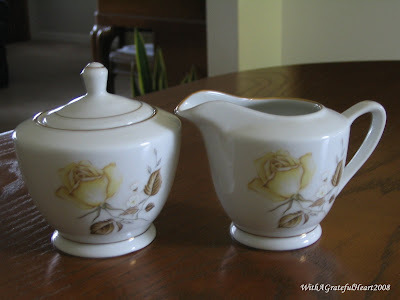 . . And a sweet sugar bowl and creamer. I don't know anything about these dishes - except that I love them. There is no pattern or manufacturer. But that doesn't matter to me. 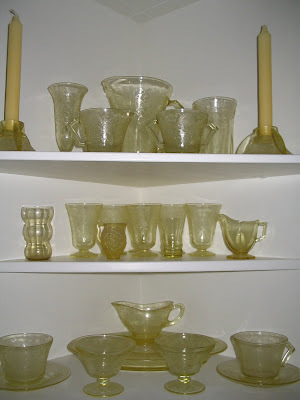 I collect yellow depression glass and old yellow pottery. They will be gorgeous together. Some of my yellow glass is in a vintage corner hutch in the dining room. I think some of my new dishes will go in the hutch with the yellow glass. Maybe. I don't know. (I have things to do with my hutch - it's still a work in progress.) Now I need to shop for the table linens I can visualize with these dishes. When I find them you will see them - and these dishes. It will be beautiful! And worth waiting for. 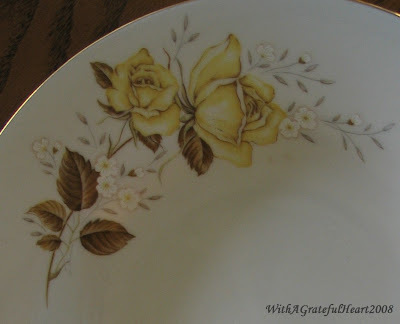 What a wonderful story...and how perfect they have yellow roses on them...they are going to be absolutely beautiful with your yellow glassware...can't wait to see it all put togethre with your linens. Don't you just love a great find? Looks like we both got lucky this weekend. 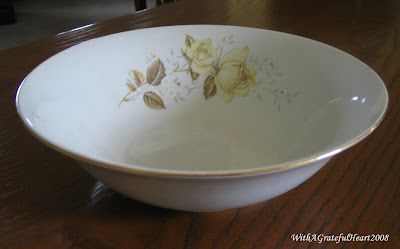 Yellow is my favorite color so I absolutely *love* your new yellow rose dishes! So beautiful and they go perfectly with your depression glass. New treasures are so fun! I stumbled across your blog via Daisy Cottage. You are only the second person I've met that collects yellow depression glass. The first is my best friend! Your new dishes will look wonderful with your glassware. As a fellow thrifter, I know the feeling you must have had to find such a trove of treasures. Adrienne, it was meant to be! 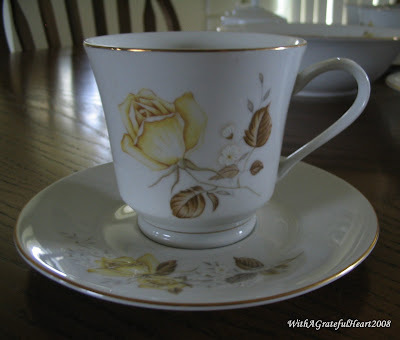 They are just beautiful (I love roses too) and they'll go so well with your yellow depression glass. What a find! 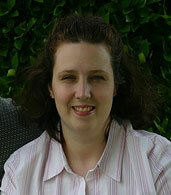 Adrienne, This is my second comment here, I'm having some difficulty leaving comments. If you received this already, please delete this one. The dishes are gorgeous! It's a good thing we don't live close or we may have battled over those!! The yellow depression glass is beautiful too, they would go really well with my yellow depression!! I think the dishes and glassware will be pretty displayed in the hutch, that way you can see them daily. What a stunning find! And these will look beautiful with your yellow glass. Yay for you! What a wonderful find! The new dishes are charming.